Peak Performers in sports know how to operate in their Ideal Performance State (IPS). They train physically and mentally to access their IPS on cue, on-demand and sustain it consistently under pressure. Peak Performers are willing to invest time, effort and resources to get what they want because they love what they do. Whenever they face obstacles, they resort to The Challenge Response instead of quitting, blaming circumstances or choking. When Pietro Fittipaldi needed to win the 2017 Formula Renault 3.5 World Championship with one race to go (Bahrain), he focused on the task at hand day-by-day for six weeks, following a carefully designed Mental Toughness protocol. When race day came, he was ready to access his Ideal Performance State and deliver at this peak - and he won. His path to becoming an F1 Team Haas test and reserve driver in 2019 was not a bed or roses: he had a serious accident in Spa, Belgium on an LMP1 car and broke both legs. He had committed to racing the Indy500 and had to undergo a tough rehabilitation process instead. Within 4 months, he was racing IndyCar for Team Dale Coyne Honda and proving his resiliency, perseverance and determination. The racing media worldwide recognized him, and Team Haas realized they had found a unique individual to join them. Pietro understands and practices what it takes to become a world-class, legendary Champion - and so can you. Peak Performers design their Moonshot, the plan to achieve their greatest aspiration, by practicing mental rehearsal. They patiently build a path to it. As disciplined practitioners, they engage in project management by reinforcing their strengths, improving their weaknesses, learning what they need and practicing as if they already are what they want. Enzo Fittipaldi wanted to be a Champion, like his brother Pietro. We embarked in a year-long process of designing his path, focusing on becoming “The Best Under Pressure” as he competed in the 2018 Formula 4 Italian and German Championships. At the start, he had to balance the stress of his life at the Ferrari Development Academy and racing by finding ways to recover. Enzo is very competitive and focused, yet he learned to enjoy the pressure to put together fast qualifying laps that led to 22 podiums, 14 pole positions, 8 victories, the F4 Italian Championship and #3 in the German Championship. You too can learn to "love the battle" and summon positive emotions to carry out the winning strategy that delivers Championships. Peak Performers in sports are motivated by committing to a personal goal. Their passion for achievement shuts out doubts and fear of failure. There’s only one path forward: learning, improving and enjoying every success. They understand that professional sports requires a team and emotional support. Those who become Champions nurture positive relationships and ask for help when they feel lost. I met Gabriela Sabatini when she was a shy and talented 9-year old tennis player in Buenos Aires, Argentina. At 11, she was beating 20-year old players (that’s when I realized she was a future Champion). At 15, she was in the semi-finals of the French Open playing against Chris Evert. There was never a doubt that Gabriela would be a top-3 WTA player. However, in 1990 and when she was #3 in the world, her father called me asking for help: Gabriela wanted to quit playing. Sport psychologist Dr. Jim Loehr and I met with the family that same evening in Miami. We identified key issues that were hampering her progress and killing her joy. Her dream was to win a Grand Slam, so we designed a precisely monitored approach to help Gabriela recover her confidence and the results started to improve. Within 5 intense months, Gabriela Sabatini won the U.S. Open Championship, her first and only Grand Slam, beating her nemesis Steffi Graf in the final. She went on to become a Wimbledon finalist, a Tennis Hall of Fame inductee and one of the most recognized and celebrated women in sports. It was a remarkable example of the power of full physical and emotional engagement in the crafting of your dreams. You too can find out what goal deserves your passionate commitment and find out how to make it a reality. Peak performers question their assumptions and their limiting beliefs. They constantly monitor their situation and their progress and are willing to challenge what they know and how they perform. Peak performers determine the core competencies they need to excel and reach the top of their sport. They identify what capabilities lead to dominate their field and train systematically to enjoy consistent results. There’s no other goal but the top. 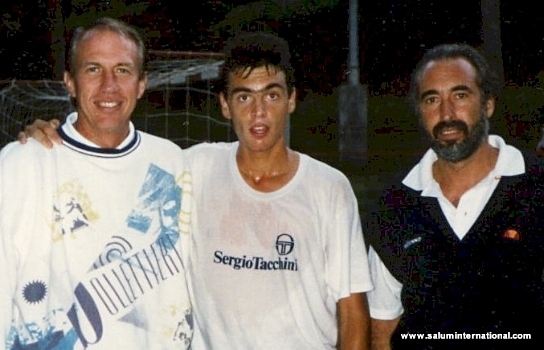 Sergi Bruguera was coached by his father Lluis at their Bruguera Tennis Academy in Barcelona, Spain and rose to the top 20 ATP players in 1990. Always an insightful and wise coach, Lluis Bruguera realized that tennis was changing and for Sergi to reach the top 10 he had to evolve his game. Dr. Jim Loehr and I traveled to Barcelona for two years, monitoring Sergi’s mental training and helping the father-son team improve their communication. Gradually, Sergi started to mature as a competitor and became a fierce and confident opponent of the top ranked players. In 1993, Sergi won the French Open Championship, repeating his victory in 1994 and rising to #3 in the world. He was recognized as the most dominant player on clay courts during the period 1990 to 1994 thanks to his consistency and mental toughness, and he was also a silver medalist at the Olympic Games in 1996. His success paved the way for other Spanish clay court experts to appear in the world scene and at Grand Slams, such as Alberto Berasategui, Juan Carlos Ferrero, Albert Costa, Alex Corretja, Carlos Moya and ultimately Rafael Nadal. When you commit, you too can become a Champion.